Tune in to watch the show on Wednesday 7 July. There are plenty of warm smiles to complement the heat of the Cairo summer but behind the traditional hospitality of the Egyptian people there is a division between those who tell you that they believe the revolution is the beginning of a positive change for their country and those who say life simply goes on as before. There are many – such as those working in the country’s vital tourism industry – who still welcome the revolution but face an uncertain future with a fragile economy, longing for the day when the visitors will return to the pyramids. Rima Maktabi and producer Neil Curry go over scripts under the Egyptian sun. On the day we visit Giza the tourists are around 10% of their usual numbers – we have that information from a man who knows better than anyone. Dr. Zahi Hawass is officially Egypt’s Minister of Antiquities but inevitably, as one of the world’s best known archaeologists he’s unofficially known as Egypt’s Indiana Jones. His ever-present “Indy” style hat does nothing to detract from such a title. Dr. Zahi Hawass, aka Egypt's Indiana Jones, hopes recent archaeological finds will entice back tourists scared off by the revolution. He tells us that visitors have been scared off by the revolution but points out that none of the many foreigners in Egypt at the time were hurt and no tourists should feel unsafe visiting the ancient treasures of the Pharaohs. He hopes that by September the numbers will be returning to previous levels, irrespective of whether the country is undergoing elections by then. When Dr. Zahi discovers that the tourist police have been demanding money for access to filming the story he summons a group of officials and berates them in no uncertain terms. 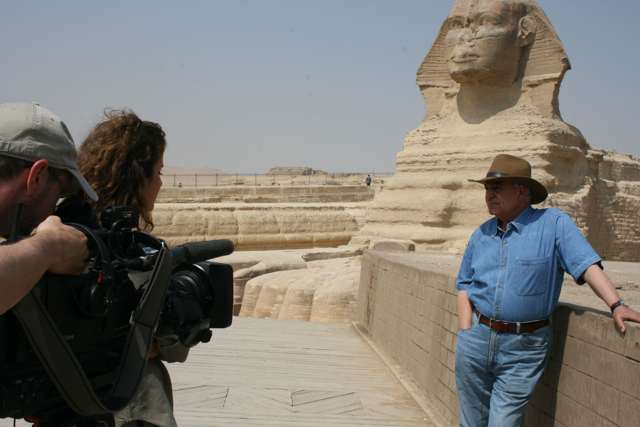 The ground beneath the feet of the Sphinx seems to shake as Zahi storms off with a trail of chastened officials in his wake, leaving us to relish the opportunity to shoot more footage from a privileged position within touching distance of the ancient wonder. It’s not often you encounter a moment of archaeological history, so the IME team became wrapped up in the excitement of discovery when we learned a Japanese team was about to unearth a significant find. We arrived at the site at the base of the Grand Pyramid to find two members of the archaeological team sitting astride an enormous stone, winching it from the ground and onto a track. It turned out to be no ordinary stone but the first of 40 “locking stones” each weighing in at around 16 tons. Its function had been to lock in place a solar barge buried with the pharaoh King Khufu, who had commissioned the pyramid. It’s the second of two such vessels buried at Giza – the first has already been removed and put on display – and represents what the venerable Dr. Zahi describes as one of the most important archaeological discoveries in the world today. The boat was buried in kit form, ready to be assembled and sail the pharaoh to the afterlife, a bit like a flat-pack furniture kit on a much grander scale. 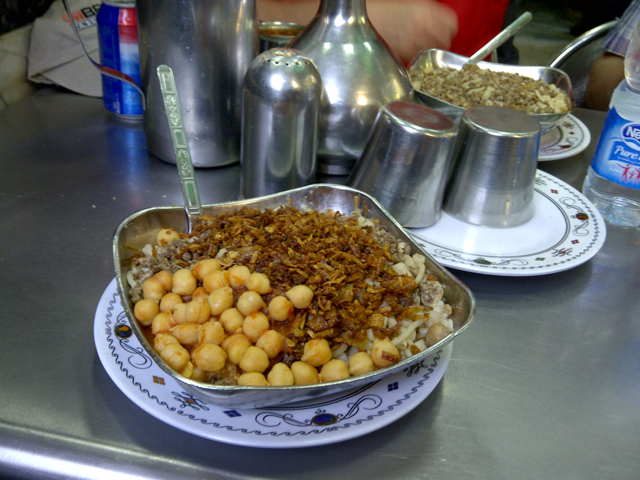 A plate of Abu Tareq's famous Koshari, a traditional and affordable favorite of the Egyptian masses. After a long hot day watching others work in the sun, the exhausted IME team is in need of sustenance. After asking several people to recommend some typically nourishing Egyptian food, we realized that Abu Tareq’s famous “Koshari" is known to almost everyone. Koshari is a popular Egyptian dish which consists of a base of rice and pasta with brown lentils, some chickpeas and caramelized onions on the top served with a spicy tomato sauce. It’s a vegetarian dish which was originally the most affordable and filling dish for the poor in Egypt but over time became championed as a specialty of Egyptian cuisine. Our route to the restaurant took us past Tahrir Square where the flags and banners waving belonged to the impromptu stalls selling revolutionary souvenirs. Traffic ground to halt here, so we set off on foot for the final fifteen minute walk to the Koshari.. Abu Tareq’s eaterie has been around for 60 years.. It’s not the kind you go to for a three course meal as your only option would be whether you want a small or a big portion of the only dish there, the Koshari. But who could want for more? You can choose to have the dish served ready-mixed or in kit form – just like the Pharoah’s solar barge only fresher – ready for you to assemble. Tasty and cheap, the devouring of the Koshari produced a rare moment for the IME team – a few precious minutes of satisfied silence. Matar Ebrahim Matar, a former MP for the opposition party Al Wefaq, was born in Bahrain on May 3, 1976 into a well-known family. He was the fifth of seven children from his father's third wife. His father, a simple farmer turned wealthy businessman, had 11 additional children with his two other wives. It is a big family that includes different political and ideological views, a family member said. (None of his family is named out of concern for their safety.) A family member described Matar's brothers and sisters as "leftists, Islamists, Communists, some...conservative and some liberal." Matar was brought up in an environment where politics was a part of daily life, according to a close friend. Before he resigned from the Kingdom's Parliament to protest the government's crackdown, Matar represented the biggest constituency in Bahrain, approximately 16,000 people. Matar was one of 18 Al Wefaq MPs who resigned. As the youngest Member of Parliament, Matar is described as very intelligent by Khalil al Marzooq, another Al Wefaq leader who resigned. Most of Matar's family are active members of Al Wefaq, the main Shiite opposition group, or the secularist Waad party. Two of Matar's brothers were detained in the 1990s, during a wave of Shiite unrest. Now, it is Matar who is locked up. He is accused of "public incitement for regime change and deliberately spreading biased rumors, in addition to taking part in public gatherings," according to Bahrain's state run news agency. He has pleaded not guilty. His family said he was a shy, but bright child. He went to Al Razi primary school in Daih village – the sight of protests earlier this year – where his family still lives. He continued his studies at Jedhafs intermediate school and Naim secondary school. He was always a top student, a close friend of Matar's said. He studied in Kuwait, where he obtained a Masters degree in Computer Science specializing in Artificial Intelligence. Matar left for Kuwait in 1994, the same year an uprising began in Bahrain. "Bahrain went through years of brutal crackdown on protestors just like now," Matar's friend remembers. The unrest continued until Hamad bin Isa al-Khalifa, the King of Bahrain came to power after the death of his father. "The situation in Bahrain calmed down and went through a quiet reform period as promised by Hamad," his friend said. Matar was away during this period, but "he was so concerned about what was going on in Bahrain and decided to contribute (to) any reform process that would help improve the situation of Bahrain," his friend said. When Matar returned to Bahrain he joined Al Wefaq and helped establish the Bahrain Youth Center, which elected him to be the center's first president. Around this time he met his wife, Dr. Amal Habib. The two were married in 2003. With Amal, "He was very polite and shy," a family member said. "Although when it comes, to politics he becomes very active and vocal." In 2010 he was elected and became an Al Wefaq MP. He was active in the society and people liked him, al Marzooq said. Bahrain is a tiny Kingdom where a Sunni royal family rules over a majority Shiite population, who for years have complained about discrimination and called for democratic reforms. Matar was at the Pearl Roundabout during the protests that began in mid February. He also attended a couple of protests organized by Al Wefaq during the ensuing unrest. Bahrain declared Martial law on March 15, which was followed by a crackdown by the authorities. At least 1,000 people are believed to be in detention. Matar was at the protests because he just doing his duty as a politician to defend people, to call for their rights, al Marzooq said. Matar is being held with Jawad Fairooz, another former opposition MP, and others while he awaits his third court appearance scheduled for July 5. Matar was not at his second hearing on Tuesday June 21 for reasons that remain unclear. Guards at the court initially would not allow the family in, saying that Matar's name was not on their court list. The guards later confirmed to his family that Matar's trial would go ahead despite the fact that Matar was not there, a family member said. His lawyer asked to postpone the hearing, but according to his lawyer, the judge decided to proceed. The judge said Matar's case was a minor case so there was no need for him to be there, al Marzooq said. If it is a minor case then "why is there (a) need for him to be in custody for now two months?" Bahrain has not responded to a query about why Matar was not at his own hearing. Armed men took Matar from his car on May 2, according to his family. His wife was with him at the time. He was in solitary confinement for at least two months from May 2 to June 12. His wife Amal, who works in the ophthalmology department at Salmaniya Medical Complex, was allowed to see him on Wednesday June 22 in accordance with a judge's order, a family member said. She did not take his children, Ahmed, 4, and Sarah, 3, to see him. She "thought it is better for them not to see their father in this condition," a family member said. Matar told his wife he has not been tortured. A family member said Amal checked Matar's body to see if there were any signs of abuse. There were not. Matar also reportedly said that he had not been harmed. But a family member says they will not be comfortable unless they "see him released and given the freedom to express his opinion and views." Just because Matar said he is fine "does not eliminate the possibility of him being subjected to other kinds of mistreatment, like psychological abuse...We can't be sure that he is not threatened not to mention any mistreatment he might be facing," a family member said. A human rights activist said that Matar was beaten on the same day he saw his wife. Matar’s visit with his wife was at court on Wednesday June 22, the same day 21 people were convicted on terrorism-related charges in connection with anti-government protests. The trial was denounced by rights groups. The 21 were forcibly removed from the court and taken to a side room where they were beaten by Bahraini security forces, according to Nabeel Rajab, president of Bahrain Centre for Human Rights. Matar happened to be in that side room following the visit with his wife and he was also beaten, Rajab said. The extent of his injuries is unknown. Bahrain has not responded to a query about the alleged incident. There have been credible allegations of abuse in Bahrain's prisons. Richard Sollom, Deputy Director for Physicians for Human Rights told CNN previously, that his group could "attest to violent assault and defensive wounds on...detainees who have died in custody. We have analyzed photographic evidence of two such deaths in custody that are highly probably the result of severe abuse including blows to the face, torso, arms, and legs." Bahraini officials have said that they are investigating several security personnel alleged to have mistreated detainees. The police also questioned Amal for six hours on June 19, according to her family. The authorities asked her about Salmaniya Medical Complex, which was a focal point during the protests. Government officials allege that some of the staff helped turn the hospital into a base for the opposition and denied some patients treatment. Human rights groups believe that the medical workers are being targeted because they treated protesters and witnessed gross violations of human rights by Bahrain security forces. When Matar resigned from parliament earlier this year, a family member asked if he was fearful about not finding work. Matar said no. "‘The last thing I think about is money,'" the family member recalls him saying. "'People elected me to represent them and to defend them." It is unclear if Matar will have another opportunity to serve as an elected official again. Every year before summer rolls around Iranian authorities tighten clothing restrictions. Normally the “Moral Police” crackdown on the women forcing them to wear their hijab so that it covers all of their hair, for example. But since last year, the "Moral Police" have been targeting the men too. Last summer, the Iranian government issued a men’s hairstyle guide. This year, they banned necklaces for men. In addition, Iranian state TV has taken issue with jeans as well. A YouTube videofrom Iranian state TV features a discussion in which jeans are said to actually come from the word "jinn" – invisible creatures who know the unknowable. The young man in the video says wearing jeans is also supposed to have a hazardous effect on a man's testicles because it raises the temperature. This, according to Iranian state TV, renders men infertile. This annual clothing crackdown is the government’s attempt to distract citizens from their real problems. Iran suffers from large scale unemployment and internal political paralysis. It is also facing the threat of even more sanctions. Will talk of sorcery or criticizing jewelry stop the Iranian people from thinking about their real problems? Unlikely. The Sunni “National Unity Assembly” demonstration planned for Saturday afternoon in Bahrain was cancelled. A twitter statement from the group said the Kingdom’s leadership requested the cancellation. The cancellation follows a large demonstration by the main opposition group Al Wefaq on Friday, which was attended by an estimated 30,000 people. It was the second such gathering by the opposition since the end of the state of emergency. The Sunni gathering had called for people to meet on Saturday afternoon at the National Stadium and walk toward the Prime Minister Khalifa bin Salman Al Khalifa’s palace which is about one kilometer away. The group supports the national dialogue, but is against an elected Prime Minister. Also Saturday Bahrain’s Justice, Islamic Affairs and Endowments Ministry issued a statement saying steps are underway to lift the ban on the secular Waad political party. The party was closed down earlier this year. Its leader Ibrahim Sharif is jailed. Israel's foreign minister Tuesday denied that an American-Israeli law student being held as a spy in Egypt worked for Israeli intelligence. 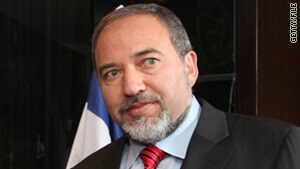 Israel's foreign minister Avigdor Lieberman says he has no idea why Ilan Grapel, 27, should be detained. Avigdor Lieberman has no idea why Ilan Grapel, 27, should be detained, he told Israel Radio. Grapel was apprehended Sunday and ordered held for 15 days on suspicion of spying for Israel, said Adel Saeed, a spokesman for Egypt's general prosecutor. Grapel was taken into custody in a five-star hotel in downtown Cairo, Saeed said Sunday. Grapel's mother said he had been staying at a $9-a-night youth hostel. Israeli diplomats visited Grapel on Tuesday, according to Egypt's Israeli embassy, and found him to be in good health. Israel continues working for Grapel's release, the embassy said. The party of Turkey's ruling prime minister sailed to an easy victory in parliamentary elections on Sunday, winning a third term in office with 49.9% of the vote with 99.9% of the votes counted. But marring the night, an unknown number of people were wounded at a post-election party. For nearly a decade, Recep Tayyip Erdogan has dominated Turkish politics while also defining his country's assertive new role as an economic and diplomatic power in the region. Campaigning on his record of unprecedented economic stability and prosperity during nine years in power, Erdogan and his Justice and Development Party (AKP) succeeded in slightly increasing his mandate. The AKP won 49.9% of the vote, an increase of nearly 4 percentage points from the party's performance in the 2007 parliamentary election. "We are thrilled after winning one out of every two voters' votes in the country," Erdogan said late Sunday night. 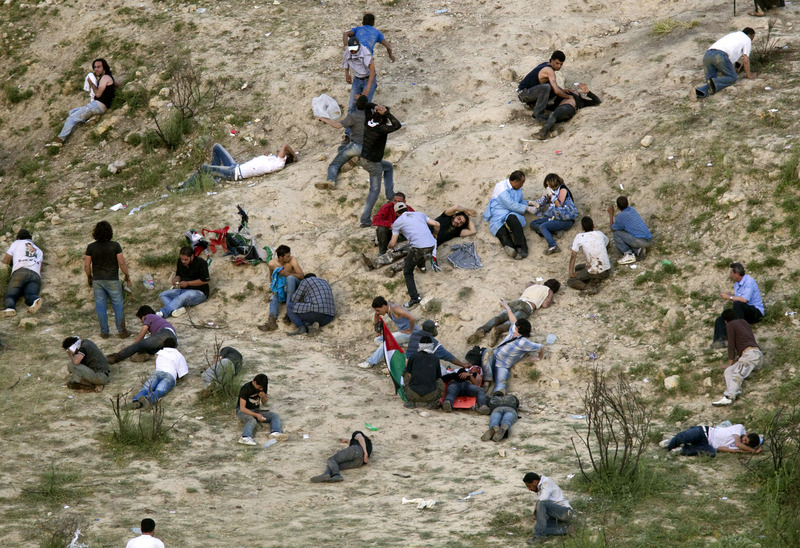 Demonstrators lie on the ground recovering from Israeli army fired teargas as they gather along Syria's border with Israel. Israel and the United States on Monday blamed Syria for violent protests on the country's border with the occupied Golan Heights. 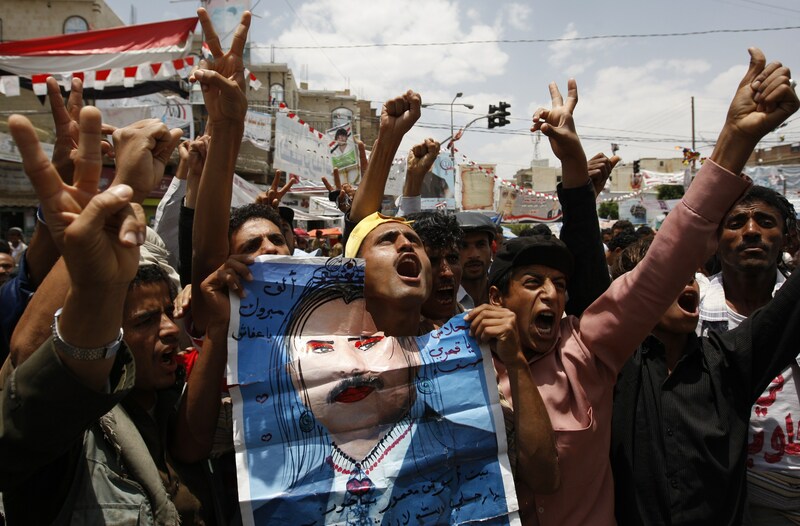 Yemeni anti-government protesters shout slogans during a demonstration calling for the ouster of President Ali Abdullah Saleh in Sanaa. Effective Saturday night, Yemeni Vice President Abed Rabbo Mansour Hadi took over Ali Abdullah Saleh's responsibilities as president, Yemeni government spokesman Abdu Ganadi told CNN. The power transfer comes as a source close to the Saudi government said that the long-time Yemeni ruler arrived in Riyadh around midnight Saturday, a day after being hurt in an attack on a mosque in his palace. Some Yemeni officials continue to insist that Saleh, who for months has resisted calls to step down, is still in Yemen. Yaser Yamani, Sanaa's deputy mayor, told Yemeni state TV Saturday night that "Saleh is still being treated in the military hospital in Sanaa." Welcome to the Inside the Middle East blog where CNN's journalists post news, views and video from across the region. This is also a place where you can start the discussion so please keep your comments coming. We highlight not only current news stories but also anecdotes and issues that don't always make the top of the headlines.